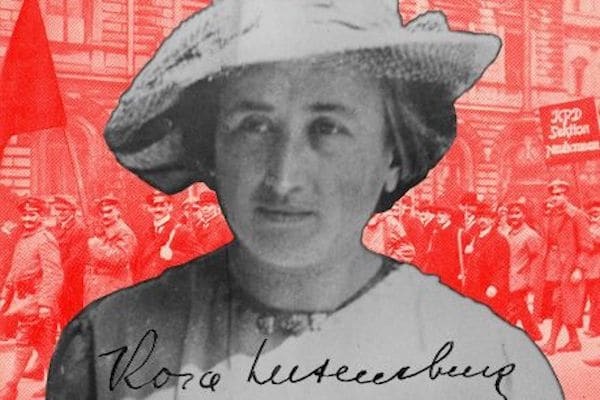 Throughout her life- from her political awakening as a schoolgirl in Warsaw until her murder in Berlin 1919- Rosa Luxemburg dedicated her immense energies, talents, capacities and intellectual prowess to the goal of the world socialist revolution. Rosa understood that the stakes were high, that the fate of humanity was at stake and, as a woman of action, she gave herself completely to the great historic battle for the emancipation of humanity. Rosa is certainly a product of her times, but because she was such a great revolutionary and an intellectual, she had talent to act and look way into the future, instead of being consumed by immediate demands her times. That’s why her actions continue to have resonance, that’s why her ideas remain relevant 100 years after she was murdered. Imperialism and democracy are certainly the two big areas Rosa made some invaluable contributions. That’s why I agree with the apt choice of the organisers of this seminar for accordingly framing the topic for discussions: “100 Years of Rosa Luxemburg’s Marxism: Imperialism, Democracy and Lessons for the South African Left”. But again imperialism and democracy were very important in Rosa’s time because of the capitalist crisis that lead to the capture of democratic institutions by bourgeois forces and the rise of fascism and imperialism. Today we see history repeating itself with the deepening crisis of global capitalism, that began in the 1970’s, after the post-World War II growth cycle got exhausted and slipped into downturn of stagnation, and reached its apogee with the 2008/09 Great Recession that has now turned into a Long Depression, as Michael Roberts and other economists (from both liberal and radical persuasions) appropriately call it. Democracy has significant importance today as it was Rosa’s time. In Rosa’s time there was a crisis of democracy following the defeat of European radical socialists (who went by the name Social Democracy) and the bourgeois liberal capture of institutions of democracy and the threat of fascism that fully developed in the interwar years after Rosa’s murder. Actually, it can be argued that Rosa was murdered by or in collaboration with fascists in their early days. Today, democracy as practiced in official political systems of the global north and global south is in crisis, a crisis of the liberal establishment and its neoliberal policies. In the north, the liberal establishment is tumbling and falling apart. That’s why you have a right wing buffoon such as Trump as the US president and the right winger Macron in France. In the global south, formal democracy has tended to be a caricature of the democratic fraud of a democracy as practiced in the north, which is largely limited to representative democracy, with very little meaningful participatory democracy if any. That’s why in Africa democracy has been fraught with manipulations by former liberation movement parties and other right with parties. That’s why in Brazil there was a ‘legal’ coup d’ tat, followed by an election buffoon right winger in Jair Bolsonro. But again, in both global north and south, we see the rise of fascism from the decay of liberal formal democracies. We have to reflect and analyse the rise of fascism today because, whilst it has similarities with the interwar fascism such the deep crises of global capitalism as the context that sets the scene of this fascist development, there are divergences that come out of the fact that history always moves forward. So even in instances where history repeats itself, it never does so in returning cycles. The same applies to the crises of democracy and imperialisms as they manifested then and now. There is obviously no time to delve deep into of these three subjects. So I will just summarise. Rosa Luxemburg’s concept of imperialism was deeply connected to her concept of capital accumulation. In turn her theory of capital accumulation was largely based her crisis theory of capitalism. Rosa’s main proposition was that capitalism, as closed system, produces lesser than its available capacity for consumption. That is capitalism has a problem of underconsumption or overproduction. She largely based this on the fact that workers ’wages are lower than the product they produce, this therefore creates problems for the realisation of surplus value. Rosa’s major economic theory is lied out in her 1912 seminal book, The Accumulation of Capital. Those who think of Rosa as an economist, they like to refer to this work as Rosa’s magnum opus. Rosa Marx’s accumulation schema as outlined in Capital was incomplete as it had a shortfall in capital accumulation that it did not address. Rosa’s acknowledged that Marx’s research work on Capital was incomplete, and that probably explained the shortfall in Marx’s accumulation theory. Remember Marx’s initial plan was to have 6 volumes of Capital: volume one on the general mode of capitalist mode of production, volume two on landed property, volume two on wage labour, volume three on the State, volume five on international trade, and volume six on world market and crises (see Ernest Mandel in Capital Volume One, Penguin Classics, 1990). Only volume one was published during Marx’s life time in 1867, volume two and three were published posthumously by Frederick Engels. Volume one dealt with the general mode of capitalist development, volume two dealt with circulation and volume three dealt with the crisis theory. Theories of Surplus Value which was published by Karl Kautsky is always regarded as volume four. Rosa thought there is shortfall in Marx’s schema of capital accumulation in a closed capitalist system, that is, in accounting for the national output through constant capital, variable capital and surplus value. This is because workers earn lower than what they produce, thus there is a shortfall in realizing the surplus value, and this creates an imbalance between production and consumption. Using both the simple and expanded accumulation models, she could only account for both constant and variable capital that could be maintained and expanded. But then she struggled, still using Marx’s method, to explain and account on the ongoing realisation of the surplus value, since workers earned lower than what they produce, because in effect they are exploited to produce the surplus value. Even after she included the consumption expenditure by capital, there was still a shortfall in the overall consumption because of lower workers’ wages (See Paul Sweezy, The Theory of Capitalist Development, first published in 1942). To cover for this shortfall, Rosa thought of the world market, to integrate noncapitalist or backward societies in a dependent way, as a solution. That’s the nucleus of her imperialism theory. It also included imperial rivalries, hence it has military expenditure. Wars, revolutions and instability in the world economy had gained prominence during Rosa’s time. I will not go into the controversies that her accumulation theory provoked in Marxist intellectual circles. It suffices to remark though that Rosa made did not just popurilise Marx’s work, she advanced it further, making a meaningful contribution in Marxist economic theory, particularly in the age of monopoly capitalism. Rosa’s views on imperialism put her on the side of the peoples of global south in the polarised global capitalist system that is predicated on accumulation of the countries of the north by dispossessing countries of the global south. She also advances an internationalist solidary between workers of the global north and those of the global south. That’s why she was among the few socialists from the west who did not support either of the sides in the South African Anglo-Boer War of 1899-1902. She denounced the Anglo-Boer War as an imperialist war. Her economic views about the global expansion of capitalism- accumulation crises, lack of effective demand (underconsumption or overproduction), the monopolies, increasing of finance in the form of foreign loans, stagnation – have dominated most of the post-World War II era economic debates, into the 21st century. These issues have been taken up by such prominent economists such Michal Kaleki on his theories of business cycles and demand, John M Keynes on effective demand, Joan Robinson who was a leftist Keynesian , Josef Steindl on stagnation, Paul Baran and Paul Sweezy on monopoly capital. Rosa was disappointed with lack of support and enthusiasm about the Russian revolution from Western Europe workers movement. She attributed this to the loss of revolutionary initiative by the workers in the west, following the bourgeois capitulation of by Social Democratic parties in support of the First World War. European socialists who had succeed to a Eurocentric world view. That’s why she condemned the AngloBoer War as an imperialist war when many European socialists sided with Britain as an advanced capitalist country that could help SA on the path of capitalist development. Here Rosa’s views take forward Marx’s view that socialism is essentially a revolution of the majority by the majority for the majority. In this sense, Rosa was the foremost leading advocate of democratic forms of workers organisation and popular struggles in her generation of theoreticians and revolutionaries. The international movement of the proletariat toward its complete emancipation is a process peculiar in the following respect. For the first time in the history of civilization, the people are expressing their will consciously and in opposition to all ruling classes. But this will can only be satisfied beyond the limits of the existing system. On the one hand, we have the mass; on the other, its historic goal, located outside of existing society. On one had, we have the day-to-day struggle; on the other, the social revolution. Such are the terms of the dialectic contradiction through which the socialist movement makes its way. History has vindicated Rosa on the failure of centralised left parities, and her support for mass movements with mass initiative and organisation has won the day. The working class demands the right to make mistakes and learn in the dialectic of history. Let us speak plainly. Historically, the errors committed by a truly revolutionary movement are more fruitful than the infallibility of the cleverest Central Committee. South Africa is undoubtedly in the throes of a deepening political and social crisis since 1994; poor governance and political crisis, economic crisis and stagnation, high unemployment, widespread poverty, worsening township and rural underdevelopment, and environmental destruction. Two big outcomes seem possible from this deepening crisis: a resulting decadence or a radical social transformation. There is no third way for as long as the crisis is not halted and reversed, we are headed for the worst. It is as if Rosa Luxemburg’s quip that its either “socialism or barbarism” is coming to bear. Only a meaningful social transformation can really save South Africa. This means a genuine renewal of the left in South Africa as a social force for a meaningful social transformation. This will take enormous efforts because the left is very weak, as we speak. The left has no presence in mainstream electoral politics, even with the establishment of the Socialist Revolutionary Workers Party of NUMSA. Mass movements are generally weak with no coherence in advancing formidable anti-capitalist struggles. The SRWP is a nonstarter because it pursues the old model of communist parties that has failed. It has no concept or imagination of democratic forms of organisation and popular struggles. South Africa’s political and social crisis is driven by two main factors: (1) lack of a meaningful social transformation by the ANC following the 1994 democratic breakthrough, and (2) the obscene corruption that is worsening in threatening proportions from the ANC decline. The effect of lack of meaning social transformation is widespread poverty, growing unemployment, deepening inequality and an environmental destruction. This is because of the neoliberal policy solutions that have not been to resolve the structural faults in our economy and society, in terms of addressing the apartheid legacies and the social problems flowing the post-94 capitalist growth path. Even after Nasrec, with Ramophosa at the helm, there is no halting and reversing the crisis. There is no renewal that the ANC is pursuing. It is all the perpetuation of rot and crisis, albeit in a slower pace. The ANC under Ramaphosa is only better, but still lack the requirements to effect a meaningful renewal. We see the intensification of the factionalist wars all the time in the ANC and in many state departments. The Robert McBride saga is the latest manifestation of these factionalist wars that lays it bear that there is not renewal being pursued. The way forward for the left, out of the current political crisis, which is threatening to be a tragic impasse, is not to form a workers party or a vanguard party that will contest elections with a socialistic manifesto and hope to win or get some parliamentary seats. Any preoccupation with some centralised party of the left will be a serious distraction. Instead, the left must work with popular classes to build strong grassroots and sector movements that must fight for the immediate social demands of the popular classes on health, education food, women, youth, sports, arts culture etc. Whilst those struggles should be about immediate social demands, they must have a clear anti-capitalist outlook and seek to go beyond the limits of the current capitalist society. Those struggles must express a yearn for a better society that is not capitalist. Struggles for reforms in the here and now in order to ameliorate people’s conditions are going to be essential in building the long-term momentum for a genuine left renewal. These struggles should be based on the constitution, and other democratic rights and demands, including the regulation of the private sector. Struggles for alternatives and transformation will be essential in grounding the left and mass movements in an anti-capitalist and anti-neoliberal outlook. These should be on matters concerning development in townships and rural areas. These include such matters as seed banks, solidarity economy, public goods and services such as education, health, transport, housing etc, social wage, renewables and so on. Popular struggles that must characterize the left renewal must be made up of both protest and developmental work. A range of community development activities should cover art, culture, media, including magazines, poetry cultural movements, people’s heritage from below, knowledge production from below that includes research, studies, publications of all types; audio, visual etc. Let me conclude by quoting Rosa’s words to her comrades just two weeks before her murder: “Today we can seriously set about destroying capitalism once and for all. Nay, more; not merely are we today in a position to perform this task, not merely is its performance a duty towards the proletariat, but our solution offers the only means of saving human society from destruction.” These words are important in the context of the deepening crisis of global capitalism that is not going away, and thus posing a stark choice between “Barbarism or Socialism” as Rosa once quipped about the deep capitalist crisis that lead to the two world wars in the 20th century.